Get recognized as the best eHealth solution in Europe! 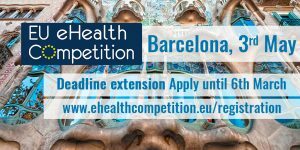 Submit your digital health solution to the eHealth Competition before the 6th March. This year we introduced a new track on Diabetes. SME, get recognition for your eHealth Solution by entering the eHealth Competition! TICBioMed´s aim is to provide support for the SMEs’ business success, offering a path to increase visibility and marketing opportunities to attract customers, partners and external capital. The 6th Edition call for applications will remain open until 6th March. The novelty this year is the launch of a Diabetes track to reward the best solutions for the population management of the disease. 1 in 10 adults will have diabetes by 2040 -642 million- and 12% of global health expenditure is spent on this disease. Let’s give visibility to the solutions that will improve the life quality of diabetes patients. The eHealth Competition 2017 will be held in partnership with the Health 2.0 and the Healthio Events, taking place at the Fira Barcelona on May 3rd.